One of my favorite aspects of teaching is sharing quality literature with children – which is rooted in positive, engaging experiences I had reading and discussing books with my own children. When my daughter and son were in elementary school, they rarely were seen without books in their hands. They toted them around wherever they went. When my son was five, he began creating movie posters and sequels based on favorite books. It was something he loved to do! Some of my favorite family memories revolved around J. K. Rowling’s Harry Potter book series. My daughter began reading the series when she was in third grade and introduced us to the first movie, which got us hooked. From then on, we spent summers anticipating the release of a new book or movie in the series. We completed the series through a combination of reading aloud and listening to audiobooks together. Following the release of the fifth book, we created a Harry Potter Monopoly board game as a family project just for fun. But it could have been a great school project, as well. Creating a literature-based board game is a creative alternative to the standard book report. Comprehension can be demonstrated through the creation of questions written on cards, directions located on the board, and/or illustrations. For example, cards and game spaces could reference positive events that move a player forward and negative events that set a player back. Creating a board game also can be a means of reinforcing lessons in social studies, science, and math, and integrating technology. It even could be an alternative form of autobiography. The level of technology used in creating a board game can be varied according to factors such as student capabilities and home or classroom resources. The rather involved and high-tech process of creating our Harry Potter game touched upon numerous learning standards for English Language Arts (ELA); Math, Science, and Technology; and the Arts. This post will describe in detail instructions for creating board games from books. 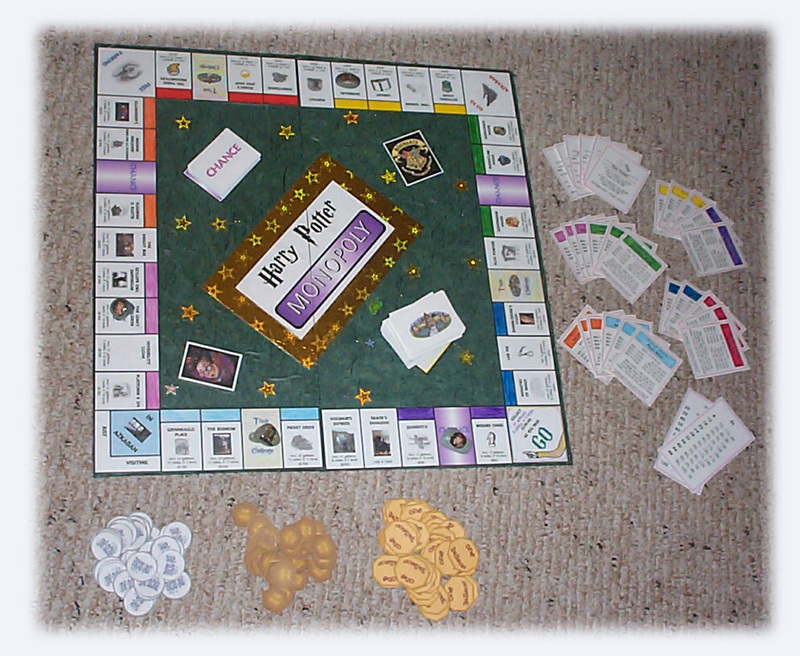 It also will describe the specific procedures involved in designing our Harry Potter Monopoly game. After reading the book, the first step in creating your own game is to choose a theme. The rich details in the Harry Potter series offer endless possibilities. However, virtually any book or series that appeals to a child could be incorporated into a game. For example, picture books written by Eric Carle or Jan Brett are well suited to the basic Candyland format. It goes without saying that there are many different kinds of board games. The next step is to examine a number of pre-existing games. Consider theme, rules, design, and whether they are based on skill, chance, cooperation, or a combination. After comparing and contrasting a few different games, you can begin thinking about what kind of game you would like to create. We chose to create a Monopoly game, which is a fairly complicated undertaking. However, simpler formats could be based on examples such as Candyland, Slides and Ladders, Trivial Pursuit, or Sorry. After selecting a format and a theme, it’s time to design the board by sketching a rough version on a piece of paper. For example, you could create a meandering design like Candyland or a grid of squares like Chutes and Ladders. This step might involve some mathematical computations, in order to create evenly sized spaces or determine how many spaces can fit. Now is not the time to make a final version of your game board. It is best to wait until the rest of the materials have been created so you can test it out to see if it really works. Cards are an optional but effective means to demonstrate comprehension and incorporate the book’s events into the game. Blank index cards work well. They can be used whole or cut in half. First, write questions or statements on the front of the card. You could include positive events that move a player forward and negative events that set a player back. Then decorate the back with stamps, stickers, simple drawings that are easily reproduced, or even digital images. Here is an example of a Simple Board Game Template. Our Harry Potter Monopoly game required two sets of cards. First, we created “Trivia Challenge” cards. For these, we came up with multiple-choice format questions about characters, places, and events in the books. This activity was rather time-consuming; we ended up with 250 cards and could have kept going! We started by writing the questions on index cards but then decided to give them a more “professional” appearance by putting them into a desktop publishing program, with 15 cards per sheet. (Correct answers were indicated in purple ink.) After formatting all of our comprehension questions, I searched for and then downloaded a whimsical PDF image of Hogwarts School of Witchcraft and Wizardry. I used the image to create a design to be printed on the back of the cards. Finally, I printed the cards on cardstock, front and back, and we cut them to size. After completing the set of Trivia Challenge cards, we made “Chance” cards with Harry Potter scenarios and consequences that involved going to a certain space on the board or paying or receiving money. This was fun for everyone. A couple examples we came up with were: “You came out in the wrong fireplace; go back 3 spaces” and, “Snape caught you wandering the corridor at night; advance to Snape’s Dungeon (but don’t collect any money for passing ‘Go’).” After creating about 50 of these cards, I designed a back, printed the cards on cardstock, and then we cut them out. Almost any small objects can be used for game pieces. The most important considerations are that they can fit on the board spaces and be easily distinguished from one another. You can make a simple game piece by putting a sticker onto a smooth stone. Or you could make a simple cardboard game piece by drawing a picture or design on a small piece of light cardboard. (Alternatively, you could glue a picture or photo onto the cardboard.) Cut out the game piece. Next, cut a ½” rectangle from the same kind of cardboard. Cut a slit in the middle of the rectangle, going halfway through. Also cut a slit of the same length in the bottom of the playing piece, and fit the two pieces together to create a standing figure. Or simply save game pieces from commercial games. We made magical game pieces out of small, smooth stones. First, I downloaded and printed images of several of the most prominent Hogwarts students onto plain white paper. For a low-tech alternative, children could draw and label their own characters on paper, cut out Harry Potter character images from print ads, or use stickers. We carefully cut around the images and then decoupaged the images onto the stones using Mod Podge mixed with a bit of fine glitter. 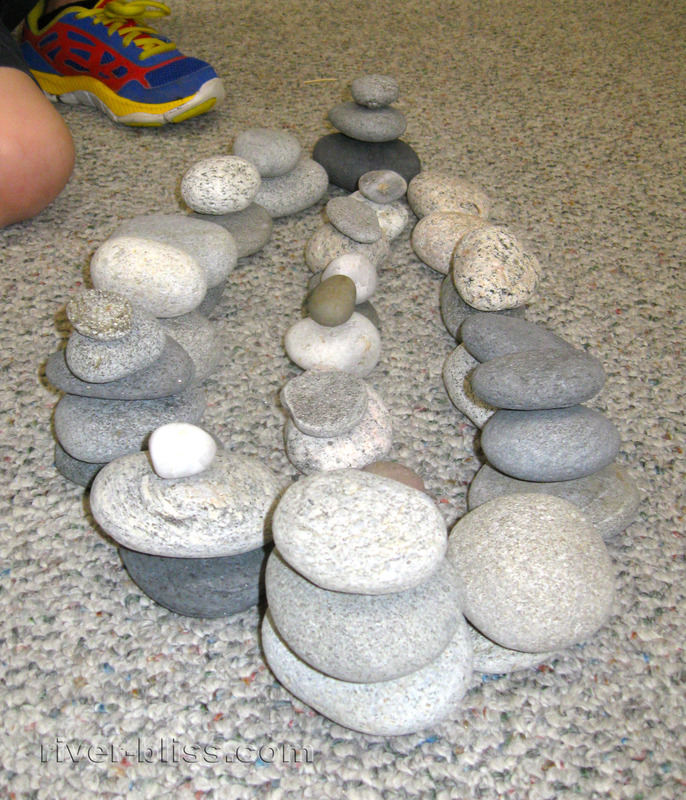 We applied three coats of the Mod Podge and allowed the stones to dry between coats. Once the final coat dried, we had magically sparkling, beautiful, and durable game pieces. We decided that our Harry Potter Monopoly game could be played either with regular Monopoly money or wizard money. Conveniently, the Harry Potter section of the Activity Village Web site (http://www.activityvillage.co.uk/harry_potter_coins.htm) contained free downloads of galleons, sickles, and knuts. I printed out several sheets of all three kinds of wizard currency, on white cardstock. Then we cut out the coins. We had to make lots of them! It became clear that players could accumulate ridiculous amounts of galleons (the largest coin) during the game, so we decided to use regular Monopoly $50, $100, and $500 bills to represent 50, 100, and 500 galleons, respectively. To make mortgage cards, I returned to the file in which I created board spaces. I enlarged the spaces, eliminated the images, and listed the rental amounts. There is actually a “dollars to galleons” converter on my favorite Harry Potter website, and I determined rental amounts by using the regular Monopoly properties as a guide. We decided to include both dollar and wizard currency amounts on the mortgage cards. This fairly time-consuming step was one I did on my own. After printing the mortgage cards, we colored them in manually with colored pencils because we liked the effect. Before making the final version, it is highly recommended that you test the game by playing it a few times. That way, you can discover what elements need to be changed, eliminated, or added in order to make it work better. Refrain from making the final version until you have it just how you want it. Before testing the game, it’s good to talk about how to help the creator(s) of the game by providing kind and constructive criticism. For example, you could establish a rule that before someone suggests an improvement, he or she must say one good thing about the game. Suggestions must be useful and neither critical nor hurtful. In the end, the creator(s) of the game has the final say. When we tested our Harry Potter game, we found it cumbersome to work with a large amount of galleons, so we decided to also use regular Monopoly $10 and $20 bills to represent 10 and 20 galleons. We also realized that, depending on the age, math ability, and attention level of the players, using three types of wizard coins might slow down the game too much. Therefore, we added an option to use only galleons (the coin with the highest value). If players decide to use only galleons, they would also determine whether or not to round sickles to the nearest galleon. For example, if there are 17 sickles in a galleon and the cost of a given property is 20 galleons, 12 sickles, and 18 knuts, players could decide to simply consider the price to be 20 galleons, or to go an extra step and round the number of sickles up or down to the nearest galleon. In this case, 12 sickles would be rounded up, making the price 21 galleons. We also realized that we needed to spell out on an instruction sheet the number of knuts in a sickle and the number of sickles in a galleon. In addition, we had to determine a realistic reward for answering a Trivia Challenge question correctly. Finally, we found it necessary to designate in writing the number of coins and bills players would receive at the beginning of the game. Wrapping paper, mulberry paper, etc. You can be as creative as you want with this step—though simpler tends to be better. In general, games are easier to play when the board is less cluttered. Begin by sketching the design using a pencil and a ruler. You could draw directly on cardboard, draw on poster paper and then glue the paper to the board, and/or cover the board by gluing wrapping paper or mulberry paper all around it. You could paint the board; glue on felt shapes, colored paper, or foil; draw on the board with permanent markers; create a collage out of magazine or book illustrations; or create designs, logos, etc. using a computer. To better preserve the board, consider laminating it with clear contact paper. (If you are drawing on poster paper that will be glued to the board, laminate the poster paper prior to gluing.) Make sure that the spaces are large enough for the game pieces to fit on them. We found that cutting the board in half is an easier alternative to creating a board that folds. If you use glue, you can prevent warping by wrapping the board(s) in waxed paper and pressing them overnight (or longer) under a stack of heavy books. To make our Harry Potter game, I formatted the spaces in Quark Xpress (desktop publishing software), using the regular Monopoly board as a guide. This was the most time-consuming step. It involved searching the Internet for free and appropriate clip art to download. (Alternatively, children’s drawings could be used.) Images for the board spaces were comprised of: chapter illustrations from the books, stills from the Harry Potter movies, and general clip art found on teacher Web sites. After selecting images for all of the spaces, I converted U.S. dollars to wizard currency with the help of The Harry Potter Lexicon Wizarding World Currency Converter. At the bottom of each of the spaces, I listed a price for that “property” both in wizard money and dollars to give players some flexibility about which kind of currency they want to use in any given game. After listing all of the prices (using the regular Monopoly board as a guide), the game spaces were ready to be printed onto cardstock and cut to size. We printed the game pieces with the colors at the top of the spaces already filled in and decided we didn’t like the way they looked. So we printed the game pieces a second time, leaving the color rectangles empty, and then colored them in ourselves with colored pencils. We all agreed that the colored pencil effect looked much better. To assemble the game board, we lined up all of the spaces on a large piece of illustration board to make sure everything fit together all right. I cut the board in half (for more convenient storage) and used Elmer’s glue to cover each half with dark green mulberry paper embellished with gold threads. Next, we glued decorations to the center of the board (spaces for the Trivia and Chance cards, game logo, the Hogwarts shield, an illustration of Harry, and gold stars). Then I carefully arranged the game spaces onto clear contact paper (with the front of the game spaces against the sticky side of the contact paper), put glue on the back of the game spaces, attached the contact paper to the game board (making sure that the spaces lined up precisely), smoothed the contact paper down, and trimmed the edges. To prevent the board from warping, we individually wrapped both halves in waxed paper and pressed them under piles of books for 24 hours. The final step is to organize and package all of the parts to the game. To keep the game intact, you’ll want to rubber-band cards together and keep game pieces and other paraphernalia in plastic ziplock bags and/or small tin containers. If you can’t find a box large enough for storing the game board, then store everything but the game board in a shoebox, and rubber-band the board to the shoebox, or just keep the board and shoebox next to each other. In a classroom setting, it’s preferable to store the board inside the box if at all possible. Decorate the box so it can be identified clearly. When the game and packaging is complete, the game can become part of the classroom resources for indoor recess or center time, or an addition to your family’s game library. Students or siblings can exchange their games with one another and enjoy playing one anothers’ games. In our case, we rubber-banded the three sets of cards (Trivia Challenge, Chance, and mortgage) separately. Then we put the three different kinds of “coins” into ziplock bags. We stored game pieces and dice in a revamped Altoids tin. First, we created a “Game Pieces” label for the top of the tin. We laminated the label with wide tape and then attached it to the tin with double-sided tape. Then we measured and hot-glued a piece of felt to the inner, bottom surface of the tin to make a nice cushion for the game pieces. We stored everything (cards, money, game pieces) in a shoebox. We sometimes used glass jewels for hotels and tiny, colored pebbles (fish tank gravel) for houses. Other times, we used the regular Monopoly houses and hotels for our Harry Potter Monopoly set, but left them in the regular Monopoly set until they were needed. For our family, the process of creating a Harry Potter Monopoly game was much more involved than we initially anticipated. However, my children got to practice a variety of skills, had a great time demonstrating their comprehension of the Harry Potter book series, and were obviously proud of the way it turned out. The finished product was a beautiful, one-of-a-kind game that everyone was eager to play. Today was the first day of school with my new crop of (mostly male) kindergartners. By the end of the day, my voice was shot, but I felt mighty tall – something I only experience in my classroom! And so a new year begins. This year, I’m working with several families I’ve worked with before, and it was heartwarming during our “Meet the Teacher” open house yesterday to hear older siblings up to sixth grade who are former students of mine sit down at the art table and reminisce about kindergarten. They remembered the most surprising things. I would have loved to be a fly on the wall last night listening to them prepare their little brothers and sisters for their first day of kindergarten. As for me, I reread a couple poems I wrote when my youngest child started kindergarten, to remind myself that – despite all the ways in which early childhood education has changed since then – sending a child to kindergarten is still a big deal for parents. The first poem, “Five,” was written a few months before my son (who is now learning to drive) started kindergarten and originally was published in the March/April 2004 issue of Mothering magazine. and seed fairies blown into the wind. to grace the kitchen table. meditative awareness of an anthill. (who have no place in this pond). bonds with the living, breathing world. when a new season beckons. he hums throughout the day. The next poem was written during his first week of school…when I wasn’t in a punctuating mood. about how quickly time passes?